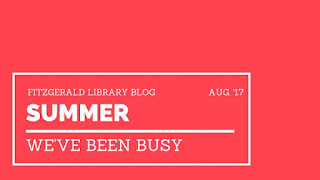 We worked on a lot of projects here at the Fitzgerald Library this past summer. In June we undertook an inventory of our entire collection, 150,000+ items, which took about a month to complete. Inventory allows us to make sure each item is accounted and in its proper place. We won’t be doing it again until 2018. Whoosh! New lower level seating area. Andy, our Evening Circulation Supervisor, started a huge project to shift and reorganize our Archives collection this summer. We hope to show off some of our collection later this fall; October is American Archives Month. We’ve still got quite a bit of work to do downstairs but we made huge progress. We’ve also been receiving, sorting, and adding donations to our collection. As of today, August 30, the library has received +1500 items, more than the total donated ALL of last year! 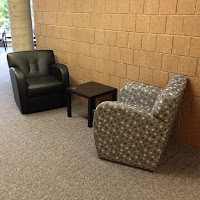 The library has also undergone some tech upgrades over the summer. All of the library computers were upgraded to Windows 10. On the upper and lower levels, we replaced our stand-up catalog stations with iPad stands. New upper level seating area. 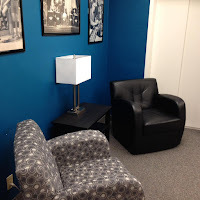 Since our last student survey we’ve been working to create more comfortable seating areas in the library, which was one of our most frequent requests. This past summer we added two new seating areas, you’ll find one of them on the upper level and one downstairs in the lower level. We’ve also changed up the study space on the main level of the library. We moved one of the large study tables up against the window, which allows for better light (we’ve also added a lamp for nighttime use) and closer proximity to a power outlet, we’ve also run a power cord under the table for more plug-ins. In addition, we’ve added a charging station for your devices at the same table. Let us know what you think of the changes. 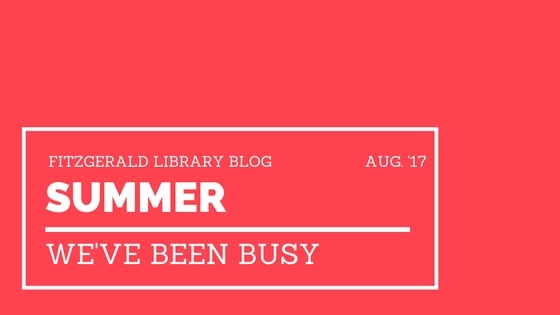 We had a busy summer and hope you did too!